OMG Mario Was Donkey Punching Yoshi This Whole Time!!! The Mario franchise might be one of the most-loved children's video games of all time, but it's also one of the most adult when you think about it. Slamming down magic mushroom after magic mushroom, beating off a giant lizard, going to any length to get "peach". Mario really should be an 18 tbh. But, today, two of the designers of Super Mario World confirmed another yet another one of Mario's suspected vices - donkey punching. Everyone knows Mario's friend Yoshi, and everyone knows that if you hit X or Y Mario will point at an item he wants, and Yoshi will devour it. Just a sec, I have to make a phone call. 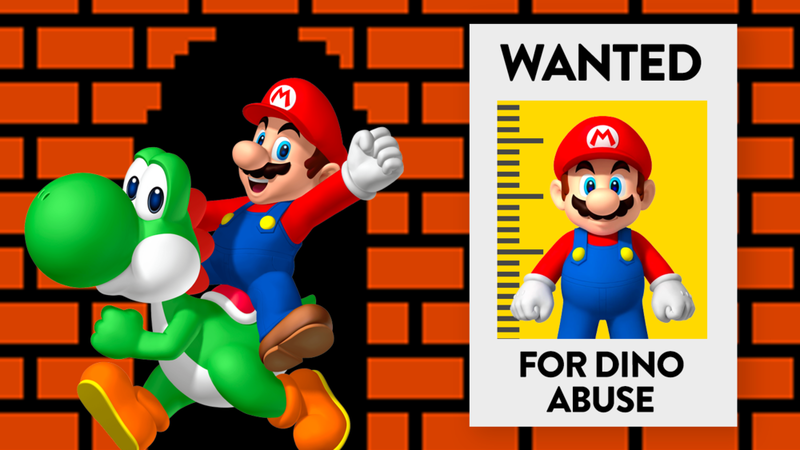 "Hello, Mushroom Kingdom PD? We'd like to report a suspected animal abuser? He's about 5 foot high, big goofy moustache, possibly masquerading as a plumber? Yes, the dino-fister, that's correct."